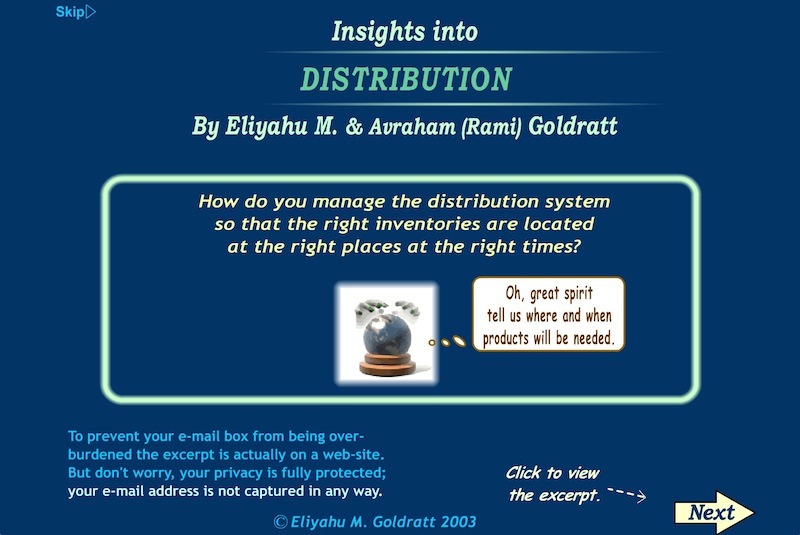 Created by Dr. Eliyahu M. Goldratt and Avraham (Rami) Goldratt, the TOC Insights are an extensive explanation of the Theory of Constraints (TOC) analysis and solution covering all the aspects of logistics, developed in an interactive type presentation for self-learning as well as group training. They outline the details of all the logistical application of the Theory of Constraints (TOC) and are as digestible as The Goal. They give us the entire common sense logic, they are short, enticing to TOC novices and still an eye opener to TOC experts. These self-learning materials are also ideal for teaching groups since they contain examples, case studies and simulations and are organized to answer in sequence the five questions of change: Why to change? What needs to be changed? What to change it to? How to cause the required change? and How to keep it as a Process of Ongoing Improvement (POOGI)? 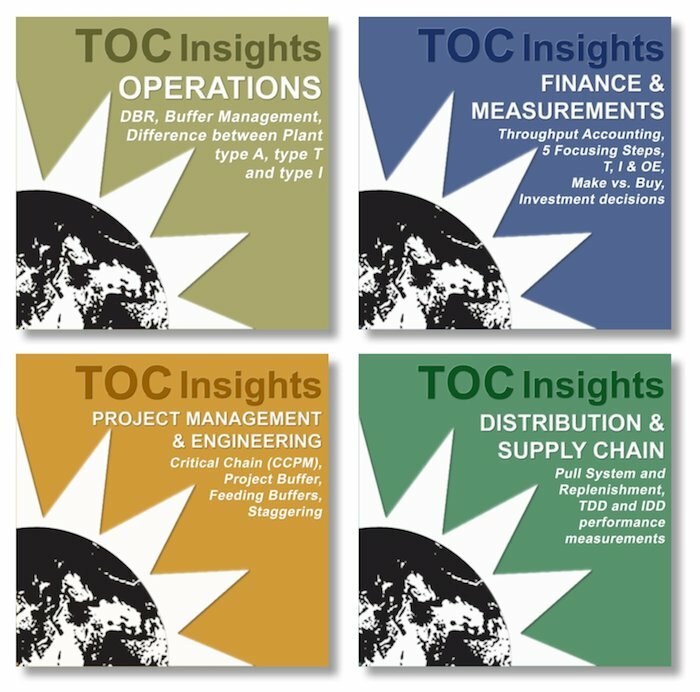 Note: The TOC Insights can be purchased by session or as a complete series. They are provided in different versions to fit the users’ needs. The Toc Insights are an excellent companion to the GSP Series or to the TOC Self Learning Program (TOC-SLP) making them a perfect complement to enrich the learning effectiveness. Learn the details of Theory of Constraints (TOC) concepts and principles applied to operations, financial decisions, project management execution, distribution logistics. Users are exposed through exercises and examples to the in-depth analysis and the corresponding TOC applications. The TOC concepts and principles can be reviewed by individuals at their own speed, as they need, or can be presented to the various groups within the organization. Clear and comprehensive learning resource can support the transfer of TOC knowledge in an academic environment. Learning at their own speed and easily review the material, as needed. Developed in an interactive type presentation. 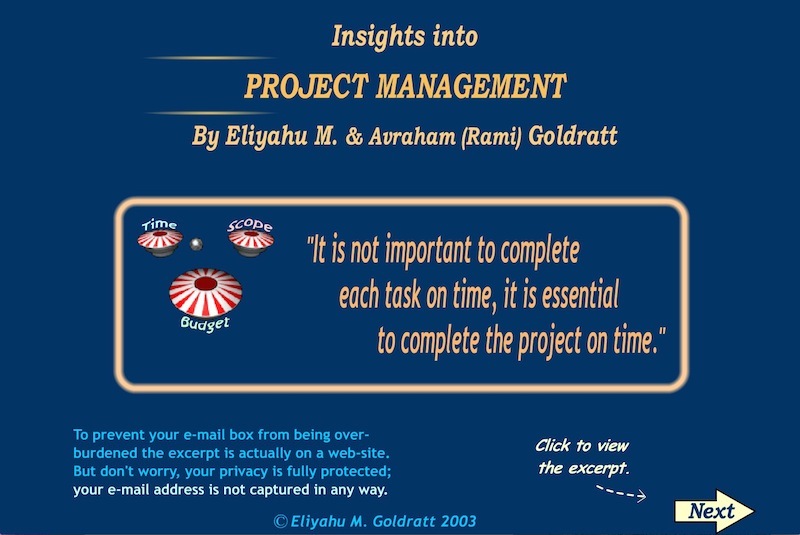 This learning tool is an interactive presentation containing detailed knowledge for applying the Theory of Constraints into Operations. 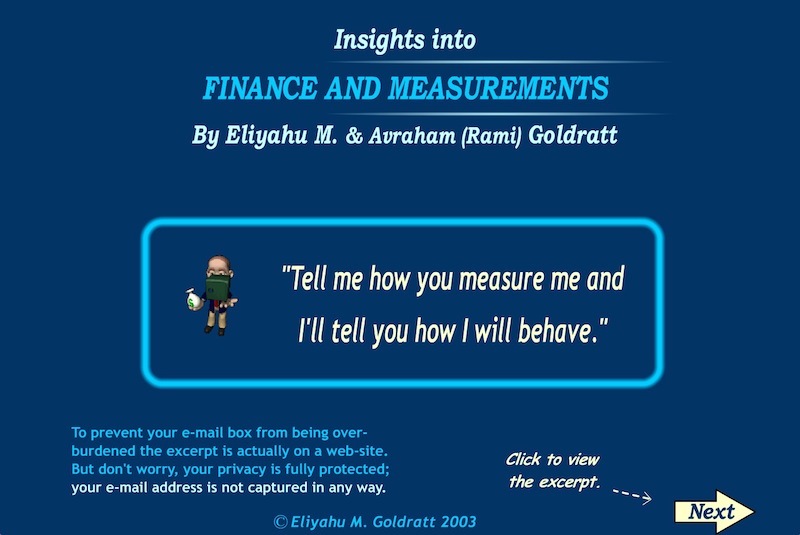 Includes examples, case studies and simulations. 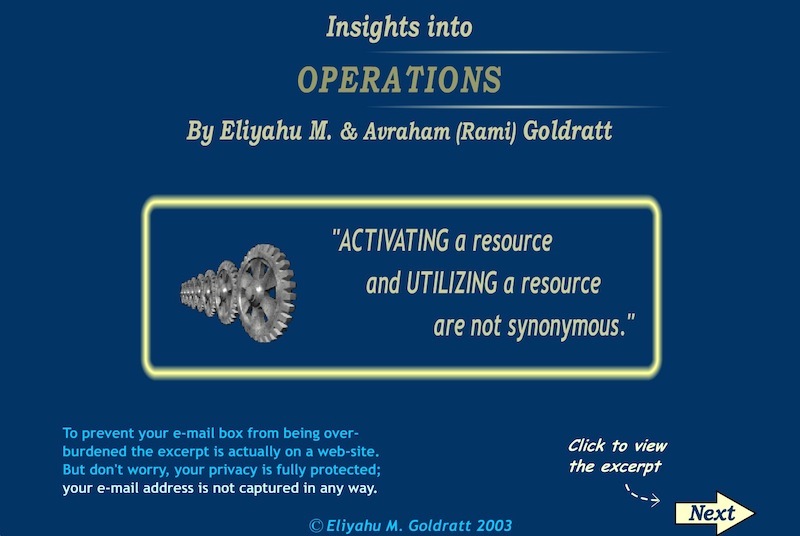 As shown by Alex Rogo in Dr. Eli Goldratt’s best selling book The Goal, you can transform operations to higher performance levels by changing to the throughout world mentality. Learn the significant impact of using Throughput Accounting on judging the system as a whole, profit centers, investment on equipment, make/buy alternatives, and product/service profit. 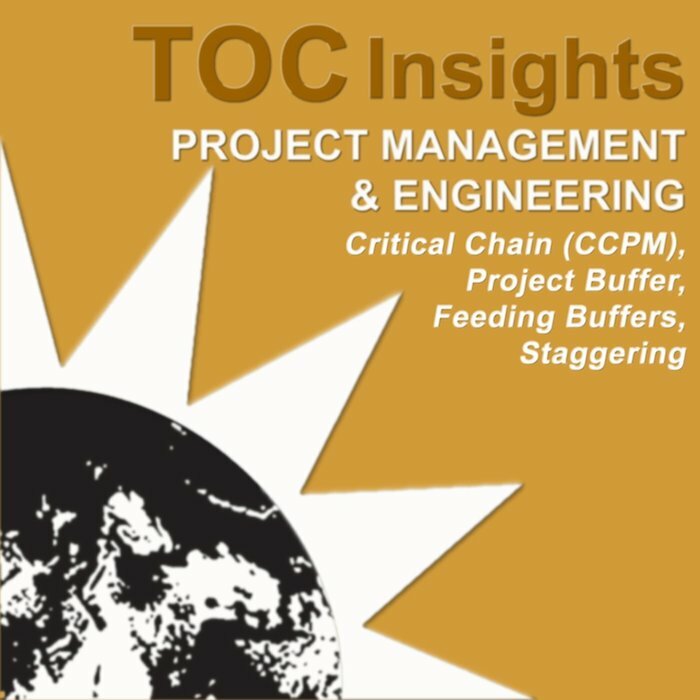 Learn the significant impact of using Critical Chain Buffer Management and its approach to deal with dependency, variability, multitasking and staggering to significantly improve execution performance results in project based environments. Learn and understand the Pull System and Replenishment approach to manage and measure the supply chain and distribution system of any organization. Downloadable Version - the download version of TOC Insights allows you to download the files onto up to two computers (Windows) for your personal use and viewing for unlimited time. Apple iOS - download and view the TOC Insights on your Apple devices including the iPhone iPad (install on up to 5 devices).